When firefighters enter their service, they expect to run into burning buildings, equipped with proper safety equipment. They don’t necessarily sign up to develop chronic disease or cancer caused by their line of work. Of particular concern, is the multi-faceted exposure firefighters have to toxins directly from firefighting (foams and chemicals released while burning in buildings), from the gear they wear, the water they drink at the fire stations, and the toxic residues and dust in fire stations from stored gear. New Hampshire House Bill 1214 was intended to prohibit the use of flammable treatment on upholstery products since we believe that during a fire, the responders are exposed to toxins when these burn — even though they have self-contained breathing apparatus the firefighters are exposed when the toxins get on their equipment and firefighters working outside the structures are unprotected and exposed to smoke. Firefighters don self-contained breathing apparatus when entering a building. The other support firefighters do not. They man the water lines, provide support for firefighters who enter the building and provide supply or safety functions outside the building — all the while without supplied air. Hence, they are being exposed to smoke and toxins in the smoke on a routine basis even without entering a burning building. The gear used to fight fires is specialized to withstand damage from high heat and to protect the firefighters from burns and other wounds. The gear is cleaned and stored in the fire station somewhat routinely and sometimes firefighters bring their gear home. In addition to toxic residues on firefighting equipment after a fire, the gear itself is made with specialized coated fabric. The specialized coated fabric is treated with PFCs to meet Structural Firefighter Standard NFPA 1971for water resistance to protect the firefighter from wearing water-laden (heavier) turnout gear, protect them from hot water spray and prevent steam burns. European Chemical Agency (ECHA) PFOA Restriction Proposal initiated by the German and Norwegian governments sets out to limit free PFOA to 25 ppb and PFOA precursors to 1,000 ppb (or 1ppm) in all manufactured articles. Following an industry-wide “consultation,” the original ECHA proposal limited the total free PFOA and PFOA precursors 2 ppb. At the time, non-governmental organizations accused ECHA of “rubber stamping” industry proposals. While tests have been done on “soiled” gear, there have been no studies conducted to determine whether routinely using turnout gear coated and impregnated with these chemicals is safe. A 2004 turnout gear suit was privately analyzed by a laboratory for eight of the thousands of possible PFCs. The highest level of the eight PFCs was 260 parts per billion (ppb), in methanol rinse off fabric patches collected from an unused suit (Table 1). This rinse analysis yields results that are only a small fraction of the content of the fabric itself yet the sample was more than 10 times higher than the higher ECHA proposed limit and 130 times the previous proposal. In New Hampshire, many of the fire stations and about 40% of residents have private drinking water wells. AFFF is sometimes used to fight fires but also for training purposes. In addition, the AFFF is washed from firetrucks in fire station bays after responding to fires. In 2016, very elevated levels of PFCs were detected in drinking water supplied to homeowners whose wells were dry during the drought by the Kingston, New Hampshire Fire Department. The source of the PFCs is AFFF released during fire training or truck cleaning activities conducted in and around the station. Since that time, 8 of the 12 wells tested at fire stations in New Hampshire had levels of PFCs in excess of the current state drinking water standard. This water is used by firefighters to cook and drink during extended shifts at the fire stations. 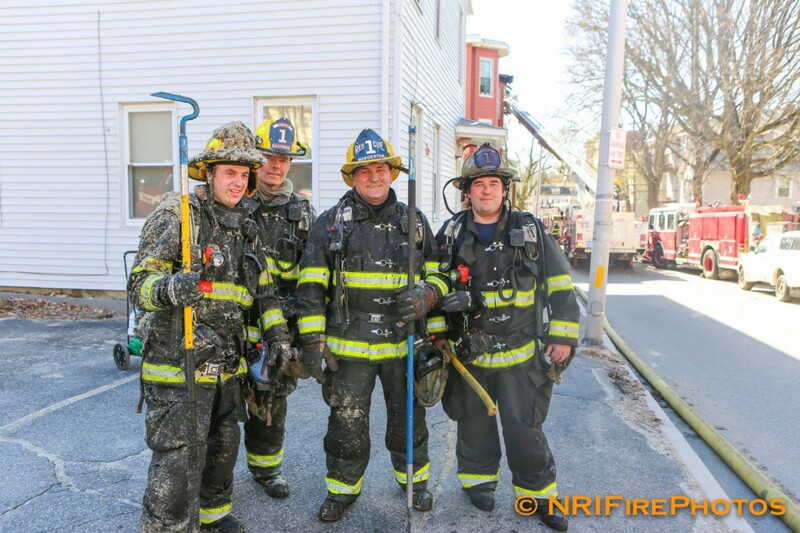 Toxic soot residue from fighting fires comes back to the fire station on gear. Additionally, as gear degrades, it is likely that the coatings used on the gear will end up as dust and spread around the gear storage area. I am not aware of any dust sampling events at fire stations that tested for PFCs. This would be an important piece of information to more fully understand fire fighter exposures to toxins. Older forms of PFCs, termed legacy compounds, had more fluorinated carbons than what is supposedly used currently. In documents obtained from industry meetings held in 1999, EPA said that the legacy PFCs met three conditions of concern because “they are persistent, bio-accumulating and toxic.”In 2001, USEPA determined that PFOA and PFOS, two PFCs, should be banned. However, they were not banned. In response to agency and Department of Defense lobbying, the agency relied on the manufactures to phase out the use of PFOS and PFOA. In 2000, manufacturers like 3M agreed to phase out the use of PFOA and PFOS but it is uncertain whether this has happened. However, they have already been released to the environment and are still components of many publicly used materials such as fast food wrappers that result in everyday low-level exposure by the general population. The replacements, termed “short chain PFCs” were sported as better for the environment and public health. However, scientific studies conducted in laboratory animalsindicate that the short chain replacements could be more toxic to humans since they accumulate longer in organs than the long chain legacy compounds. This may be the cause of cancer incidence in younger firefighters. I have been advocating for a national health study specifically focused on firefighters to assess the health outcomes because they are highly exposed. It is often difficult to tie causation with cancer or other chronic diseases. Focusing on the highly exposed populations is more likely to carefully evaluate possible negative health outcomes for exposures to PFCs. This should include, at a minimum, thorough cancer screening and annual serum PFC monitoring of firefighters to provide longitudinal data to assess health outcomes (see Table 2). It is not enough to have a cancer registry, we have to prevent cancer by taking proactive steps to identify and prevent exposures in while firefighting, in fire stations, and in the turnout gear before they make firefighters sick.